Can Facebook’s Reactions Actually Help Businesses Better Understand Fans? While the design is a bit wonky (especially on mobile) and it may not deter people from still just hitting "like," there could be some useful insight gleaned from Reactions. 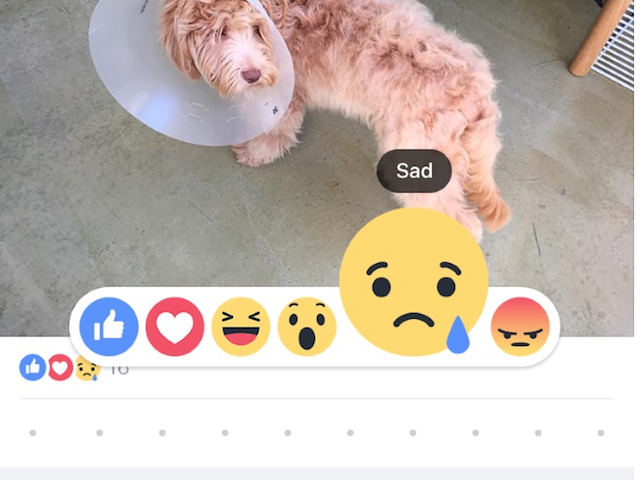 Facebook has officially launched the long-tested Reactions feature, allowing users to emote with more than a simple like. For those done decrying the lack of a dislike button, this might actually help Facebook page admins through better feedback — assuming people adopt the feature more often. While the design is a bit wonky (especially on mobile) and it may not deter people from still just hitting “like,” there could be some useful insight gleaned from Reactions. Just don’t base your entire Facebook strategy around it. For brands, it opens doors not only to evaluate the success or relevance of their content, but to create meaningful customer experiences and humanize the brand. It’s an opportunity to engage customers on a deeper level, more often and with better results. Social is fundamentally an engagement media form with the secret sauce being emotion. That’s what achieves desired business results because customer involvement drives commitment, which drives loyalty, awareness and sales. To leverage Reactions, brands first have to want to engage, and then actually do so through human-to-human interactions. Looking ahead, there may also be an opportunity here to measure sentiment, but brands need to be careful not to rely just on raw data metrics when evaluating customer emotions and behavior implications. The addition of a wider range of emotional communication through these icons not only enriches the user experience, but will grow user engagement with content and conversations on the platform. For instance, instead of just counting likes, page admins can see intent. They can see if the content posted makes readers angry, sad or if it tickles their funny bone. Reactions could help with foresight on social [media], including getting a heads up on things like social marketing crises. A ton of ‘angry’ Reactions would reflect that a brand released a controversial piece of content. It’ll also be interesting to see how the ‘like’ Reaction is used versus the ‘love’ one. However, while it’s a nice addition to the commenting feature, brands on Facebook shouldn’t take the Reactions emoji at full value. Comment sentiment is still a great way to find out how your fans really feel about the content you post. While it is beneficial for brands to clearly see who felt angry or sad in reaction to posted content – it hopefully will not come at the cost of user commenting. Emojis can be taken out of context without words, and it’s difficult to use them as a true barometer for user reaction. By nature, the reductive properties of emojis can cause discomfort if you don’t clearly align with any of the options.The bottom line for brands would be that they can’t rely on “Reactions” to understand how their customers really feel about them – there simply aren’t any nuances to a single reaction. In fact, the sentiment of the “Wow” reaction is already causing debate in social circles. On the positive side, “Reactions” provide a low-barrier to entry and voice for users to provide feedback, especially for those who don’t identify with “like/dislike.” Ultimately, this is a positive step toward improving the user experience and engagement for brands on Facebook. Readers: Do you think Reactions can help you gauge true reaction to your page’s content?